There was no tribute video or roaring ovation for Ryan O'Reilly during his first game back in KeyBank Center. All the former Buffalo Sabres center received was a "welcome back" message on the video board, which provoked a mixed reaction from the crowd Sunday evening. That would be the highlight of his return to Buffalo. 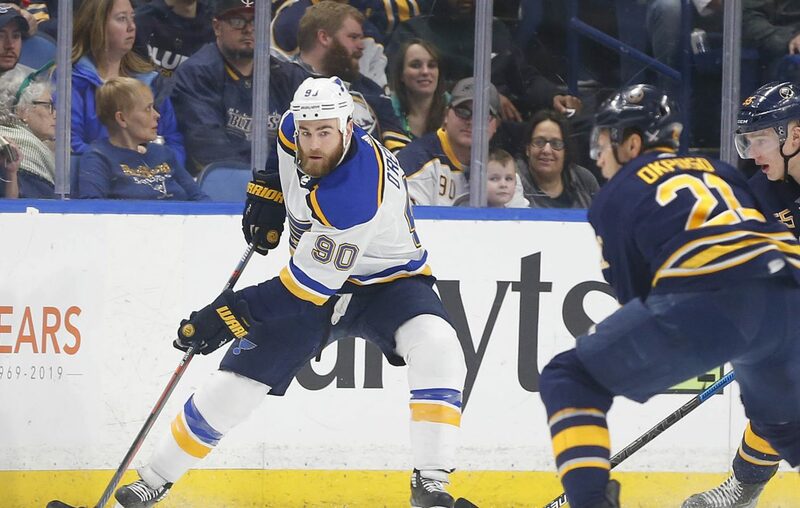 O'Reilly and the St. Louis Blues roared back to erase a two-goal deficit, only to lose to the Sabres, 4-3, when Sam Reinhart scored in the third shootout round. O'Reilly hit the post on the Blues' final attempt. The Sabres (31-32-9) snapped a seven-game losing streak and won for only the third time in 16 games. They had been shut out in three consecutive games prior to a 4-2 loss in Carolina on Saturday night, responding with an impressive win over a likely playoff-bound opponent. St. Louis (37-27-8) received goals from Pat Maroon, David Perron and Brayden Schenn. O'Reilly, who was traded to St. Louis in a July blockbuster, assisted on Schenn's tying goal in the third period. Johan Larsson, Evan Rodrigues and Conor Sheary scored for the Sabres, who received 30 saves in regulation and overtime from Carter Hutton. Opening salvo: Larsson scored for only the second time in 30 games when he skated through the left-wing circle, collected a tape-to-tape pass from Zach Bogosian and snapped the puck over Allen's blocker for a 1-0 lead at 6:42 into the first period. 169 minutes, 18 seconds: That goal snapped the Sabres' home goalless drought of 169 minutes, 18 seconds, as they had not scored in KeyBank Center since Jack Eichel had a first-period goal against the Edmonton Oilers on March 4. 90 seconds: The Blues needed only 90 seconds to tie the score when Maroon skated alone around the net and was able to unleash a wrist shot from the slot to beat Hutton at 9:12 into the game. Another drought ends: Rodrigues had gone 18 games without a goal before he gave the Sabres a 2-1 lead with 5:12 left in the first period. With Sheary trailing on what could have been a 2-on-1 odd-man rush, Rodrigues chose to hold the puck and skated toward the slot, where he shot it over Allen's glove. Alex Nylander recorded his first NHL point of the season with a primary assist on the play. Career best: With a secondary assist on Rodrigues' goal, Sabres defenseman Brandon Montour set a career high with 24 assists through 72 games. He is one point shy of matching his career-high of 32, which was set in 80 games last season. Sheary scores: Sheary pushed the Sabres' lead to 3-1 when he collected a 2-on-1 pass from Nylander and shot the puck under the crossbar with 12:14 left in the second period. That snapped a six-game goalless drought for Sheary, who has 13 in 68 games this season. Punchless power play: The Sabres went 0-for-2 on the power play and have not scored in their last 14 opportunities. 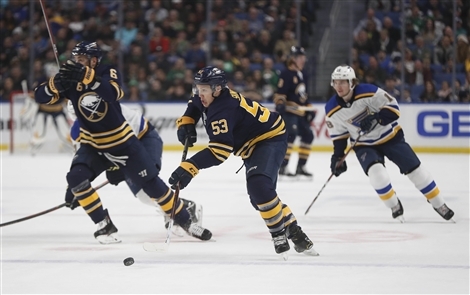 Their second in this game turned into a disaster when Rasmus Ristolainen's stick snapped on a shot attempt as the penalty expired, and the Blues rushed down the ice, where Perron cut the Sabres' lead to 3-2 at 12:15 into the second period. Dahlin milestone: With an assist on Sheary's goal, Sabres rookie Rasmus Dahlin earned his 38th point of the season, tying him with Bobby Orr for the second-most by an 18-year-old defenseman in NHL history. That total trails only Phil Housley's 57 points from the 1982-83 season. Lineup: Defenseman Marco Scandella returned after missing one game with an upper-body injury, leading Matt Hunwick to be a healthy scratch. Forward Vladimir Sobotka also was in the lineup with Jason Pominville scratched for the first time since Jan. 30. Winger Vladimir Tarasenko, the Blues' second-leading scorer behind O'Reilly, missed a fifth consecutive game because of an upper-body injury. Next: The Sabres are scheduled to be off Monday and will return to practice Tuesday in preparation for a Wednesday night game against the Toronto Maple Leafs.